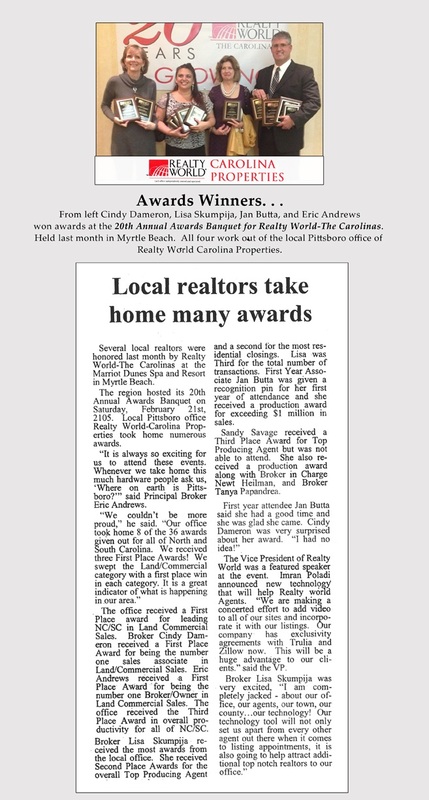 February 21, 2015, several Realtors from my office, Realty World Carolina Properties, and myself, traveled to Myrtle Beach for the 20th Annual Awards Banquet for Realty World The Carolinas. Several agents here were given many awards. What an outstanding team we have. 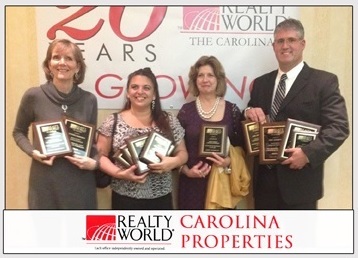 Our office, Realty World Carolina Properties , and the office itself was given one outstanding award: First Place Award for Commercial Land Sales in North & South Carolina! I was fortunate enough to receive the award for #1 Broker in Land Commercial Sales NC/SC. Other awards included Broker Lisa Skumpija with the most awards including #2 Overall Top Producing Agent, #2 Most Residential Closings, #3 Total Number of Transactions. Jan Butta received a production award for exceeding $1million in sales. Sandy Savage received a Third Place Award for Top Producing Agent, and she also received a production award along with Broker in Charge Newt Heilman and Broker Tanya Papandrea.